Is a licensed Clinical Psychologist, Past Life Regressionist, and Shamanic Practitioner who, since 1992, has studied with Tibetan, Hindu, and Sufi healers; with Lakota elders; and with Michael Harner’s Foundation for Shamanic Studies. She is also a former board advisor to the Native American Institute in Orange County. In 1995, Karen began intensive training with Peruvian Shaman Americo Yabar in the lifeways of Andean cosomology, both in Peru and in the United States. 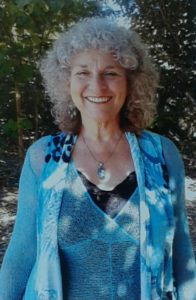 Karen leads Peruvian and core shamanic workshops, conducts drumming circles, and gives seminars and lectures on Peruvian mysticism in Los Angeles, San Diego and Orange County, CA. She has led groups to Peru over the years to work with don Americo Yabar and other indigenous shamans, and is planning future adventures.Currently Karen has a private practice is Costa Mesa, California, with a special emphasis in spiritual psychology and shamanism. 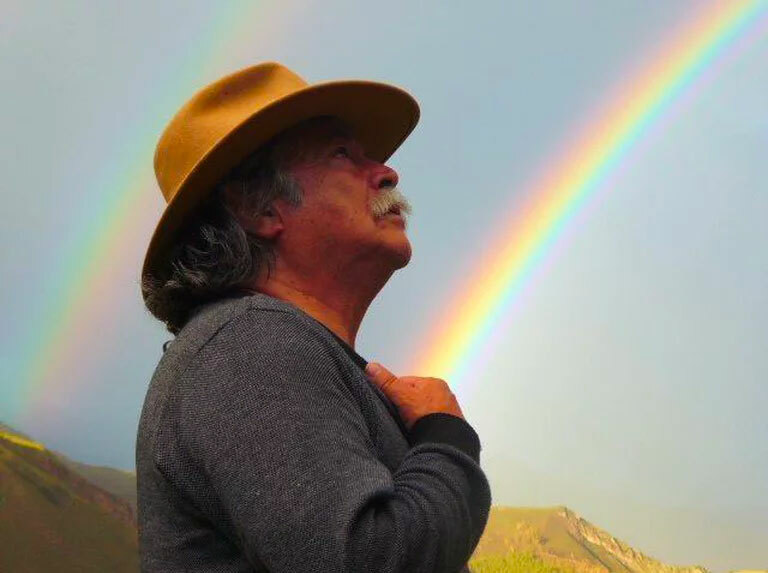 Please join us for a trip of a lifetime into the high Andes of Peru with Master Mystic, Poet, and Healer don Americo Yabar and his son Gayle Yabar. Together they will lead us into places of ancient ceremony that Westerners rarely see. Our intent will be to connect our hearts with the energies of the Apus (Mountain Spirits), Pacha Mama (Mother Earth), and the Cosmos for the purpose of personal and collective healing, spiritual growth, and transformation. This is a shamanic immersion experience of great power! Our journey begins with a visit to legendary Cusco and then on to the Sacred Valley: gateway to the spiritual dimensions of the Andes. With Americo and Gayle we’ll explore its pre-Incan villages and non-tourist areas, commencing our introduction into Andean mysticism. We will also have the opportunity to sit in sacred circle with the indigeneous Q’ero paqos for a group offering to the Spirits of the land, practiced in this identical way in the mountains for thousands of years. highlight is our stay at Gayle’s beautiful retreat home Molino, naturally lush and secluded along the banks of the Urubamba river. Here we’ll have an opportunity to open even more deeply into the loving energies of Pacha Mama. Our journey concludes with a tour of Machu Picchu, the best known and most spectacular archaeological site on the continent: the “Jewel of the Andes,” and a must see for all first-time travelers to Peru! Because our extraordinary two-week adventure with Americo and Gayle is limited to a maximum of 12 people, if this trip calls to you we encourage you to register early. A detailed packet with travel information, what to bring, cancellation policy, and other essentials will be e-mailed to you on receipt of your deposit. If you have any questions after reading the particulars of our trip and itinerary below, please contact Karen Palmer. At the Incan terraces of Tipon meet Don Americo and his son Gayle Yabar and begin traveling and training with them! In this timeframe we will embark on our exploration into Andean mysticism and meet the Q’ero paqos, participating in their authentic Andean despacho ceremony. Among other sites we will explore the pre-Incan villages and non-tourist areas of the Sacred Valley, including: the Pisaq ruins with its colorful market; the Andean village of Chinchero known for its ancient “shaman seats;” Laguna del Fuego, a remote, pre-civilization lake of rare beauty; and, if time, the Inca temple of Urco. Free day to explore historical Cusco, visiting its museums, Cathedral, unique arts and crafts boutiques, clothing and textile stores, and internationally acclaimed dining. Rejoin don Americo and Gayle and Travel to Paucartambo, the small, charming birthplace of Americo nestled in the high Andes above Cusco with its views of the Amazon Basin, then spend the week both at Americo’s ancestral home Salka Wasi with its high vibrations of mystery and magic, and also at Gayle’s spectacular retreat home Molino with its lush flowers and vegetation located on the Urubamba River shoreline: both of which are temples of great power, peace, and connection to the Cosmos. Return to Cusco Thursday afternoon for a free day on Friday to rest, integrate the energies of the journey, and, if not coming to Machu Picchu, to return home. Optional Machu Picchu Excursion Visit one of the 7 wonders of the ancient world, and experience a private, sacred tour with Machu Picchu Expert Guide, Gaby Meneses. Spend time exploring Aguas Calientes, the spiritual village below Machu Picchu, known for its hot springs, intriguing metaphysical shops and artisan market. Internationally renowned don Americo Yabar is a Master Peruvian paqo, mystic, and poet from the high Andes. For over two decades, don Americo, considered a Chakaruna, or bridge between cultures, has taught world wide the sacred practices of both the predecessors and the descendants of the Incas. Today these indigenous communities continue to populate remote mountainous regions at elevations between 14,000 and 20,000 feet. Gayle Yabar also calls these mountains his home. Living in their silent serenity has instilled in him a natural power that catalyzes this same deep awareness in others. He is an expert in personal growth and energy, and is seen as a warrior of Andean mysticism across the globe, especially by its youth. Collectively, these ancient mountain therapies are known as the Andean Cosmovision. They help each person access filaments of light found within the heart, and then activate the connection of these filaments to Mother Earth (Pacha Mama), to the Stars, to all sentient and spiritual life found within the Universe, and, ultimately, to the Infinite. Experiencing our heart in this way can transform our view of the world. Our eyes now have opportunities to “see” other dimensions of reality as portals of Love through which we can travel. Of great importance to the West, don Americo has further introduced the Andean concept of Salk’a, inspired by the Quechua word for “wild.” Used therapeutically, Salk’a refers to that undomesticated, free energy inherent in all of nature (including us) that originates in and from the Divine. Together with his son Gayle, who has embodied the Salk’a path from an early age, don Americo will encourage us to explore our own Salk’a nature. Cost of the trip with excursion to Machu Picchu is: $5,200. Without Machu Picchu, the cost is: $4,600. These prices are based on double occupancy. If you prefer single occupancy (when available) please add $300. Thank you! Please note that this deposit is completely refundable before August 15, 2019. With don Americo Yabar, Internationally Renown Peruvian Mystic, Poet, Healer and Chakaruna, or rainbow bridge between cultures, and his son Gayle Yabar, mystic and spiritual warrior. Internationally renowned don Americo Yabar is a Master Peruvian mystic, poet, and healer from the high Andes. 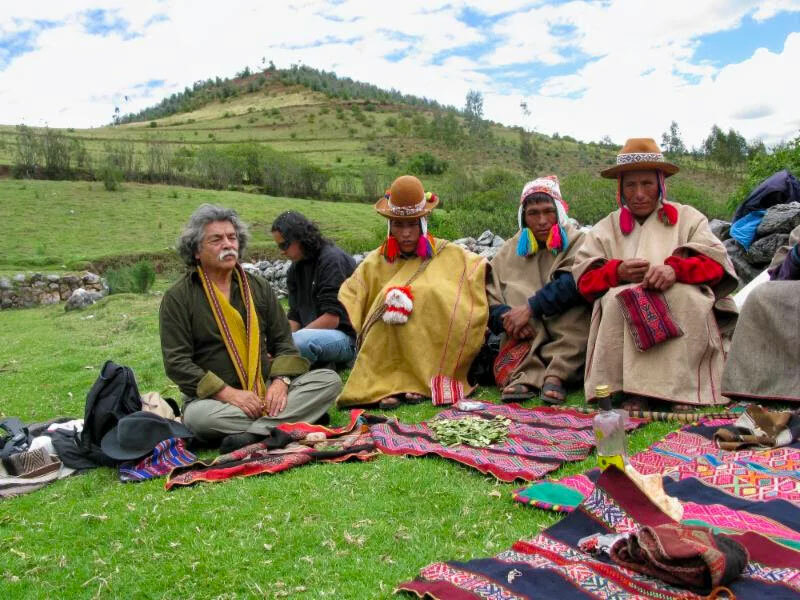 For over two decades, don Americo, considered a Chakaruna, or rainbow bridge between cultures, most specifically from the Q’ero nation, has taught world wide the sacred practices of both the predecessors and the descendants of the Incas. Today these indigenous communities continue to populate remote mountainous regions at elevations between 14,000 and 20,000 feet. Collectively, these ancient mountain therapies are known as the Andean Cosmovision. They help each person access filaments of light found within the heart, and then activate the connection of these filaments to Mother Earth (Pacha Mama), to the Stars, to all sentient and spiritual life found within the Universe, and ultimately, to the Infinite. Of great importance to the West, don Americo has further introduced the Andean concept of Salk’a, inspired by the Quechua word for “wild.” Used therapeutically, Salk’a refers to that undomesticated, free energy inherent in all of nature (including us) that originates in and from the Divine. In this two-day workshop don Americo will encourage us to explore our own Salk’a energies and will additionally guide us through teachings and healing techniques practiced by the Q’ero with as much reverence now as they were thousands of years ago. It is don Americo’s intent that each of us experience the profound effects of these mysteries directly, in deep consciousness, and with love. Please join us for a most memorable and illuminating adventure! 9:30 a.m. – 4:30 p.m. Saturday, 09/01/18. Please arrive at 9:15 a.m. Friday to sign in and get settled. Due to the sacred ceremonies in this workshop, and with respect for each participant’s experience, please allow enough time to begin promptly at 10:00 a.m. This event has limited space with a maximum of 30 participants. $75.00 deposit, due by June 8th 2018, holds your place. Please reserve your spot early. Once your payment has been received, you will be sent confirmation by email and will be eligible to reserve your lodging on the Questhaven grounds by contacting Evie Kane (see Lodging Section). Closer to the workshop you’ll also receive a Registration Packetthat includes more details about the event, including meal choices, what to bring, what to wear, directions to Questhaven, and other pertinent information. Note: Registration will close on August 3, 2018, and all workshop donations are due and payable on or before that date. Any request for a refund after August 3 will be respectfully considered on a case by case basis less a $25 administration fee. Thank you!